American national parks and sites have another series of coins in their honor in addition to the quarters. Dubbed the America the Beautiful Silver Bullion Coin™ Program by the United States Mint, these 5 oz, .999 fine silver coins are actually a sister series of the more publicized circulating America the Beautiful Quarters™. In the quarters series, every reverse design is emblematic of a site of national interest such as a national park or national forest, with one site chosen from each state, the District of Columbia and the five territories of the United States. The obverse features the traditional portrait of George Washington. 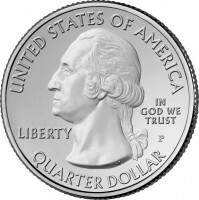 The size means each America the Beautiful Silver Coin is much larger than any other bullion coin produced by the U.S. Mint. For reference, the Mint’s staple piece for silver bullion is the American Silver Eagle, which is struck from one ounce of silver to a diameter of 1.598 inches. That makes the America the Beautiful Bullion strikes almost twice as large. To achieve the required results, the Mint purchased a new $2.2 million Graebener coining press and has been in the process of both installing the machine as well as completing test coin strikes. Early results proved problematic as the specifications require the aforementioned edge inscriptions, which tended to crumble the edges. The Mint worked through those problems but the time it took cut into the mintage levels for the 2010 issues. Only 33,000 of each design were produced, and all issues were released on December 10, much later than expected. In contrast, the 2011 issues have minimum mintages of 126,500 for each. The first two 2011-dated silver bullion coins were released on April 25, 2011. The U.S. Mint does not offer any of its bullion products directly to the public, but instead through its network of authorized dealers. As such, the new coins will be found through the same channels as the bullion American Buffalo gold coins, the bullion American Gold Eagles and the bullion American Silver Eagles. Additionally, the coins may also be sold by the National Park Service (NPS). The authorizing law provides an exception where the "Director of the National Park Service, or the designee of the Director" may purchase units of them in no fewer than 1,000 at a time, and then may resell them. As of this writing, however, the NPS has chosen not to offer the coins. The United States Mint also produces numismatic 5 oz versions. These are in brilliant uncirculated qualities and feature a "P" mint mark, unlike the bullion coins. The first issue for Hot Springs is scheduled to launch on April 28. Can you list some of these authorized dealers where I can purchase the National Park 5 oz. Silver Bullion Coins? One of the United States Mint’s authorized purchasers (CNT) finally put its 2010 America the Beautiful 5 oz silver coins on sale today (March 8, 2011). A buyer was required to call a toll free number between 3:00 p.m. and 5:00 p.m. [EST] in order to purchase the coins. My buddy and I called the number for the complete 2 hour period. We were on separate telephone lines and averaged about 6 calls per minute with redial buttons. This amounts to 4 man hours of calling and a total of 1440 telephone calls. We never got through. This is the process the United States Mint has allowed for the distribution these coins. These authorized purchasers are under the auspices of the Mint. This is a ridiculous process and a prime example of the inefficiency of the United States government. Who ever devised this process should lose their job (and let’s not forget our congressmen). And to think, the government is now in control of healthcare – if that does not scare you, then you don’t have a brain.